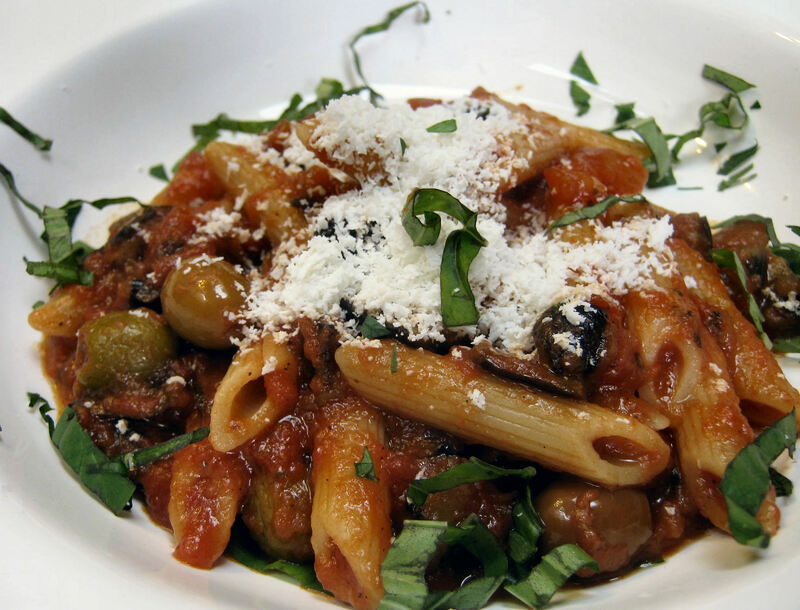 Named after an ill-fated priestess in an Italian opera (Norma), Pasta alla Norma is a classic Sicilian dish. It’s a robust and hearty meal for cool fall nights and is a great way to use up fresh, seasonal eggplant. A variation of this dish uses capers and olives, which I have used here. They really add great color, texture and flavor to the sauce. This recipe features a unique method of dehydrating the eggplant so keep it from going soggy, so even if you are wary about cooking with eggplant, give it a try. The recipe was adapted from Cook’s Illustrated, and it’s one of my fall favorites. 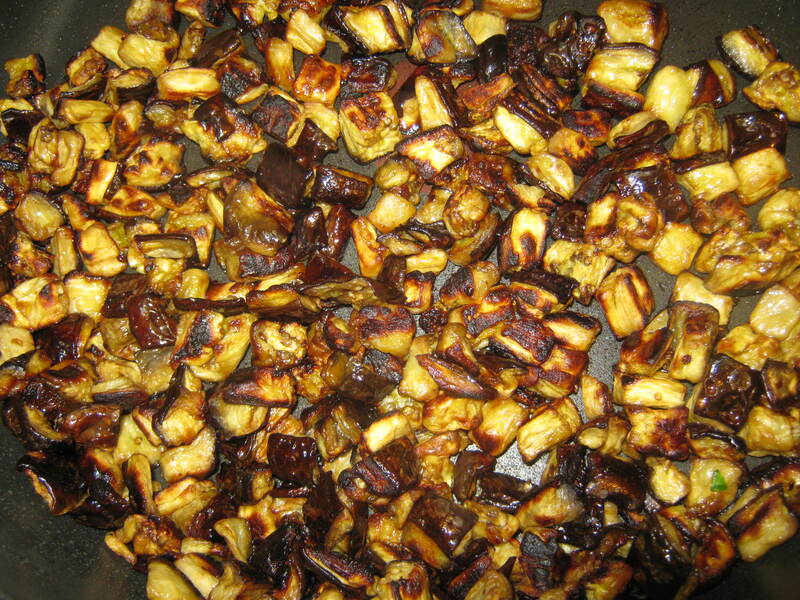 Cut the eggplant into ½” cubes, place them in a large bowl, and toss with the salt. Line a microwave-safe plate with two layers of paper towels and generously spray the towels with nonstick cooking spray. 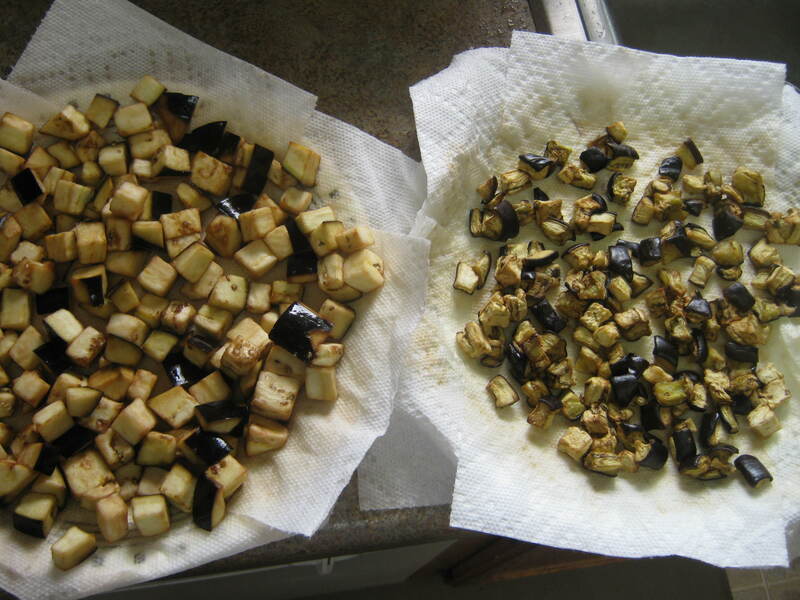 Transfer the eggplant cubes to the plate in an even, single layer (work in batches, if necessary) and microwave on High, uncovered, for about 5 minutes. Toss/stir the eggplant on the plate and microwave for 5 minutes more or until the eggplant is dry and slightly shriveled. Allow the eggplant to cool for a few minutes, then transfer it back into the bowl and toss with 1 T vegetable oil. Heat 1 T vegetable oil in a large skillet over medium-high heat until shimmering. Add the eggplant and spread it out evenly. Cook until well browned and tender, about 10 minutes, stirring or shaking the pan only about every 2 minutes. Transfer the browned eggplant back to the plate. Cook pasta according to package directions. Reserve about 1 C of the cooking water before draining the pasta. 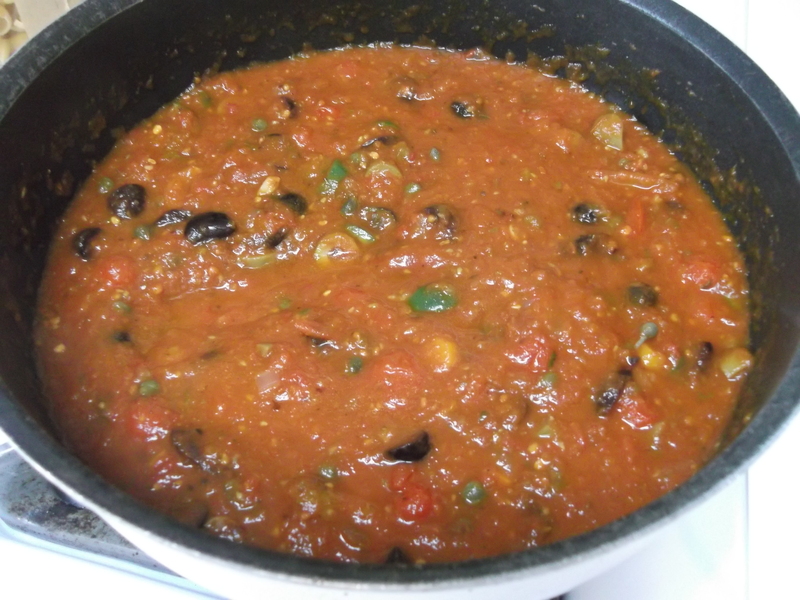 To make the tomato sauce (if not using a premade sauce): Add remaining 1 T vegetable oil to the skillet. Sauté the onion gently until soft, about 3-5 minutes, then add the garlic and red pepper flakes and sauté for another minute. Add the crushed tomatoes and stir to combine. Use a potato masher to gently break up large pieces of tomato. Bring the sauce to a boil over medium-high heat and then reduce heat to medium. Simmer, stirring occasionally, 8-10 minutes, until the sauce thickens slightly. Add the eggplant (and the olives and capers, if using) to the sauce and stir. Simmer another 3-5 minutes, stirring occasionally, until the eggplant is heated through. Turn off heat and stir in the extra-virgin olive oil; season with salt and pepper to taste. Add the tomato sauce to the cooked pasta, thinning it with a little of the reserved pasta cooking water if desired. 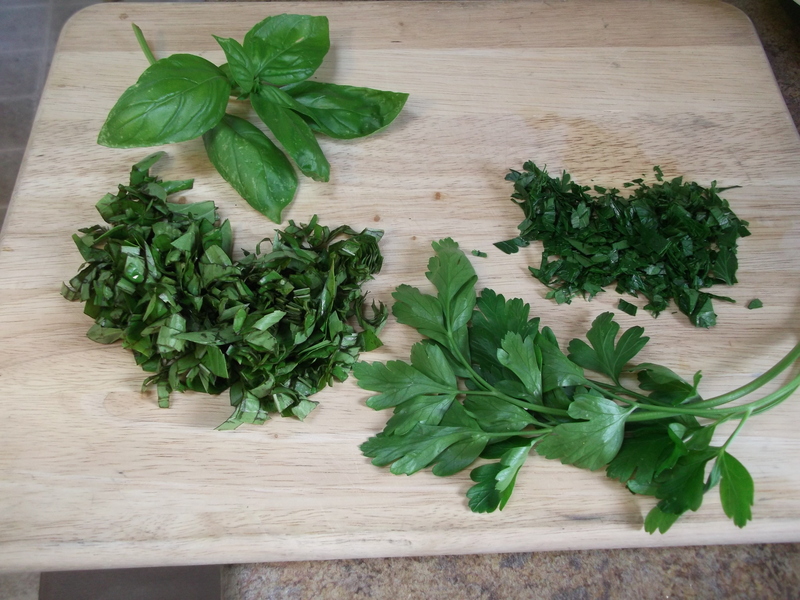 Serve topped with chopped basil (and/or parsley) and grated cheese. While there are several types of eggplant, this recipe works best with large globe eggplant, which have fewer seeds and retains its texture a little better than the others. 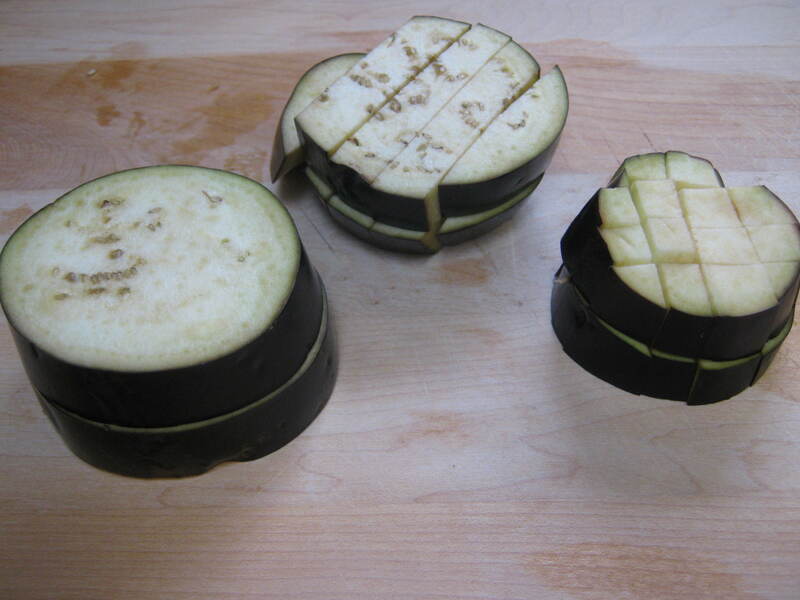 Start by cutting the tops and bottom off the eggplants, and then slicing the eggplant into ½” slices. Stack 2-3 slices and carefully cut them in both directions into ½” cubes. Watch your fingers: the more the stack is cut, the more it can wobble or fall apart. Place the cubes in a large bowl and toss with the salt. Get a large microwave-safe plate, line it with two layers of paper towels, and generously spray the towels with nonstick cooking spray. Really coat them well. Place the cubed eggplant on the plate in an even, single layer (work in batches, if necessary) and microwave on high power, uncovered, for about 5 minutes. Toss/stir the eggplant on the plate and the microwave for 5 minutes more. The eggplant should be dry and slightly shriveled: if it’s still kind of wet, put it back in for another minute or two. The idea here is to dehydrate the eggplant so it will crisp up a bit and not get soggy when you cook it. Compare the before and after shot below: the only difference is the amount of water in the eggplant. Wipe out the bowl, allow the eggplant to cool for a few minutes and then transfer it back into the bowl. No sense dirtying up a new bowl, right? Add 1 T vegetable oil to the eggplant and toss to coat. NOTE: anywhere this recipe calls for vegetable oil, regular olive oil can be used instead. However, do not use extra virgin olive oil, as it doesn’t work as well at higher temps. Heat 1 T vegetable oil in a large skillet over medium-high heat. When the oil is shimmering — but not smoking — add the eggplant and spread it out evenly. Cook until well browned and tender, about 10 minutes, stirring or shaking only about every 2 minutes. Stirring it more frequently may break the eggplant apart. Discard the paper towels from the microwave plate and transfer browned eggplant to the plate. Again, no need to use a new plate. Who wants extra dishes to clean? 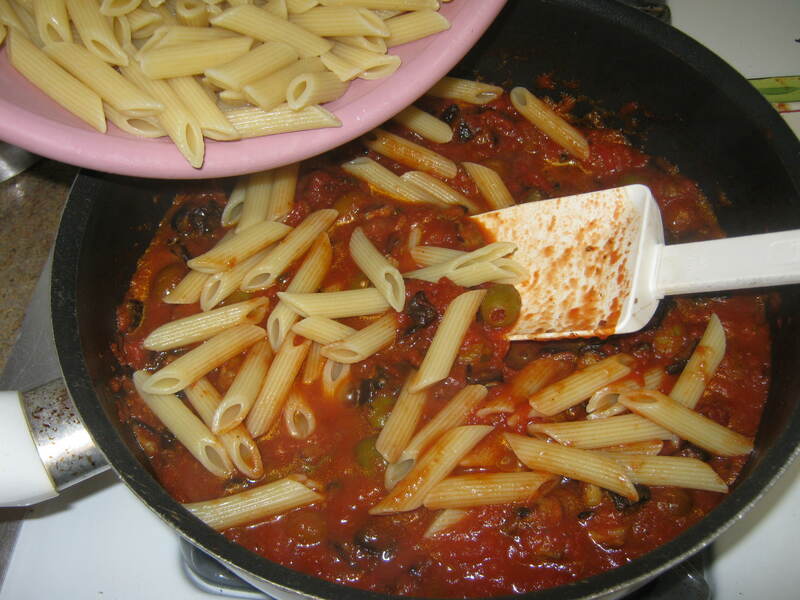 While the eggplant is browning and you are trying not to stir it too often, distract yourself by starting the pasta: cook it according to package directions. 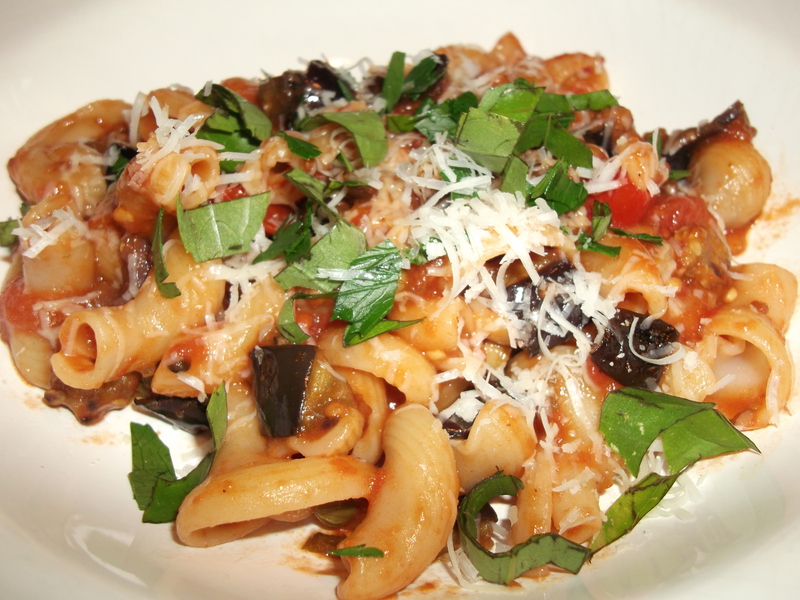 This recipe works best with tubular or shaped pastas. Reserve about 1 C of the cooking water before draining the pasta. Place the drained pasta back in the cooking pot. The next step is to make the tomato sauce. If you are using a jarred or premade sauce, you can skip this step. 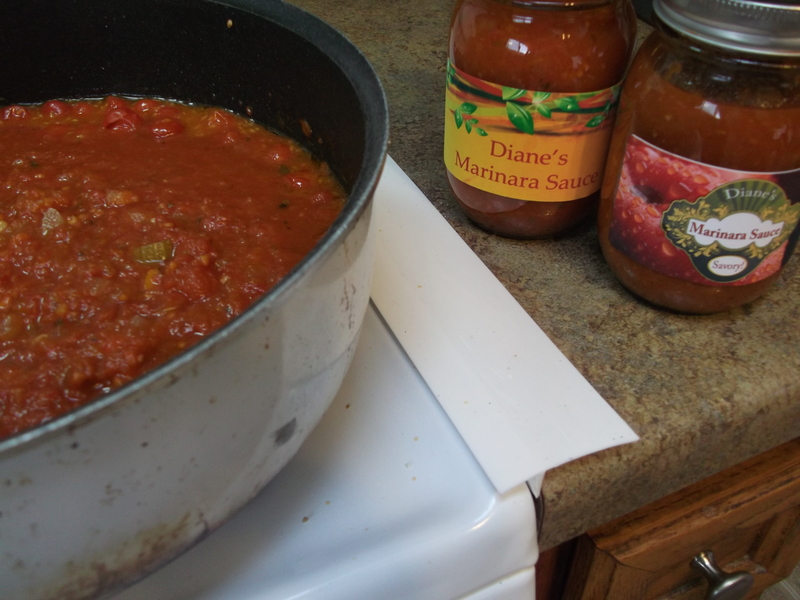 I make and can my own marinara sauce, so that’s what I used here. Make the sauce by adding the remaining 1 T vegetable oil to the skillet. Sauté the onion gently until soft, about 3-5 minutes. Add the garlic and red pepper flakes and sauté for another minute. Add the crushed tomatoes and stir to combine. Use a potato masher to gently break up large pieces of tomato. Bring the sauce to a boil over medium-high heat and then reduce heat to medium. Simmer, stirring occasionally, 8-10 minutes, until the sauce thickens slightly. While the tomato sauce cooks, you can grate the cheese (I like a very finely grated cheese), and prep some of the other ingredients, like the basil and/or parsley. I like to use both. 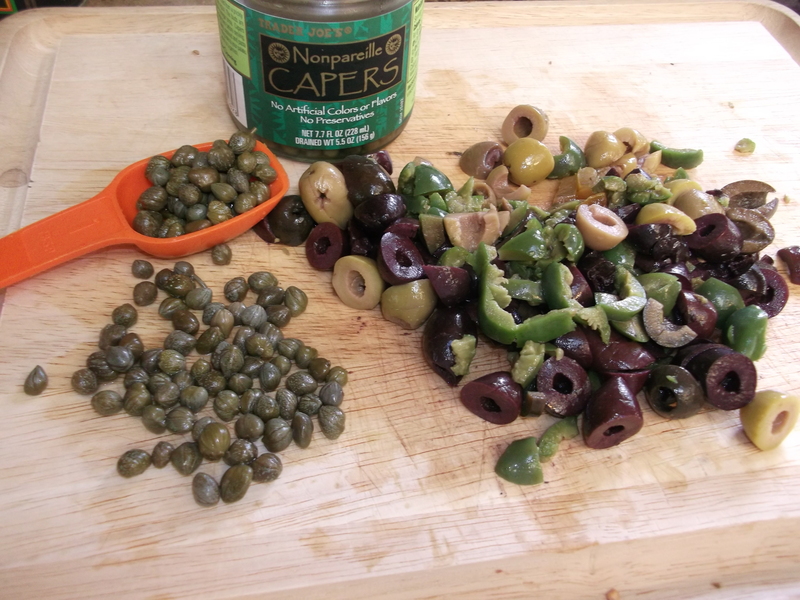 Rinse the capers and chop the olives, if using them. I do highly recommend adding the capers and olives, even if you aren’t a big caper or olive fan. They really add a nice depth and briny flavor to the sauce. I go to the olive bar at my local supermarket and get a variety of olives. When the sauce has thickened a bit, add the eggplant and stir. If you are using olives and capers, stir them in now, too. Simmer the sauce another 3-5 minutes, stirring occasionally, until the eggplant is heated through. Turn off the heat, stir in the extra-virgin olive oil, and season to taste with salt and pepper. 2) add just enough sauce to coat the pasta (good option if you have more sauce than pasta: use just what you need and save the rest). Leftover coated pasta can get mushy when reheated, especially if it was frozen, so I prefer to freeze any extra sauce on its own. Regardless of how you mix them together, mix them well and add a little of the reserved pasta cooking water to thin the sauce if desired. Serve topped with basil (and/or parsley) and grated cheese. Enjoy! This looks amazing. I’m a huge fan of John Contratti’s “Cooking With Mr. C.”. I have now added you to my “Favorites”. Keep those recipes coming.